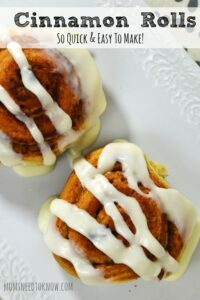 Looking for an easy cinnamon roll recipe for fresh, homemade cinnamon rolls? This recipe can be made quickly and there is no waiting for the dough to rise! In a small bowl, mix ¾ cup brown sugar and 1 tablespoon cinnamon. Set aside. In another bowl, mix the flour, sugar, baking powder, baking soda, and salt. Add in the butter and milk and mix with your hands until it becomes a kneadable dough. Split the dough in half. Sprinkle a small amount of flour on a clean surface and roll out the dough to be a rectangle shape about ½ inch or less thick. Melt additional butter and spread over the dough but make sure you do not get it all the way to the edges. Sprinkle some of the brown sugar and cinnamon mixture over the top of the dough. Roll the entire rectangle up and slice into 8 pieces. Place in a greased 9x9 cake pan (you will need 2). Bake the rolls at 400 degrees for 15 to 20 minutes or until the tops of the rolls are slightly brown. Top with frosting. Whip all ingredients together in a large bowl. You may need to add more or less milk depending on the consistency you desire for the frosting. Spread over warm cinnamon rolls. You can easily make several batches of these and freeze them before baking! Just wrap them well before freezing and allow to completely defrost before baking!